If you have started missing home payments and haven’t been in communication with your lender, you’ll want to start today! Give them a call and explain the situation you are in and see what options they have available before they start the foreclosure process. Illinois has a foreclosure timeline the lenders and courts follow, you should know more about it too. Foreclosure usually starts with a few missing house payments. When this happens lenders usually file for a Notice of Default. This often happens between 60 and 120 days or your third missed payment. If you’ve reached this step, your pending foreclosure is now on public record but you still have options. You need to take action. You’ll start receiving letters from real estate investors offering their services. That’s great, however deciding who to work with can be stressful. You’ll want to make sure you work with someone who has your best interest in mind. Educating yourself about your options is the best way to know who will help you and who is looking to take advantage. The timeframe to answer the court as to whether you can pay, state your case as to why you shouldn’t be foreclosed on is small. You’ll need to have this answer within 30 days and the lender will move forward with a Summary Judgement Hearing. Here you can state your case, it is recommended you find a good real estate attorney to help you through this process. There are options every step of the way and there are professionals who can help you. 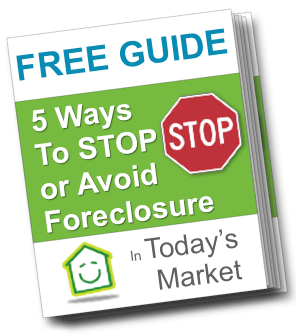 Our Stop Foreclosure Guide can help you before you even enter this process. Download it now.